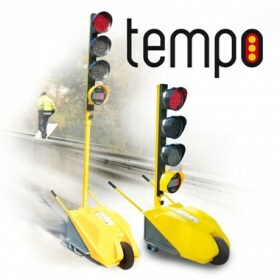 TEMPO is the only work site traffic light to incorporate a display of waiting time in minutes and seconds. Visible from a distance of 40 meters, the waiting time display discourages drivers from passing through. With the standard remote control the commands are clearly shown on the display coupled with its ergonomic infrared programming module. 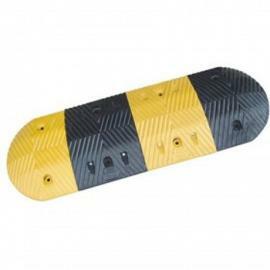 Managing the progress of traffic on a site has never been so easy. In its standard version the Tempo traffic light also offers the ability to manage alternating traffic at three and four branch crossroads. It supports the management of cross-cycles and changeover cycles on green. Programming and management interface using an infrared link with mobile synchronization panel. Module protected by a polycarbonate surface. Alpha-numeric display of 2 x 16 characters, of all cycle, programming and check information. Telescopic mast: closed 1.55m, open 2.20m. Detection of vehicle movement in a priority direction activates the lights cycle (i.e. site exit, fire rescue, police, ambulance etc.). The lights must be synchronized using the radio link communication option or the cabled option. Management of traffic flow time, as a function of the traffic density in both traffic directions. The lights adjust to match the traffic flow (i.e. large numbers of cars in one direction in the morning, and in the other direction in the evening). Light operation mode management using a radio remote control (i.e. set lights on red for exit of fork lift trucks or for safe working between the two lights etc. ).